The dish which is a source of proudness for Sicily is caponata siciliana, an aubergine-based recipe originally sicilian but then spread throughout the Italian Peninsula. 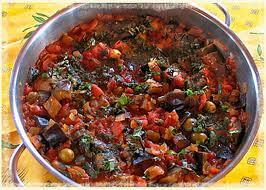 Outside Sicily, nobody but a Sicilian can make a real caponata, though. This refreshing summer and vegetarian dish is ideal for stimulating appetite on a very hot day!!! In Palermo the caponata can also include fish. Strip the filaments from the celery sticks, blanch them in lightly salted water. Then cut them into little pieces, sauté them in a little oil. Wash and dice the aubergines,put the pieces in a strainer, sprinkle them with salt, and let them sit for 12 hours to draw out the bitter juices. Then blanch, peel, seed and chop the tomatoes. Once the aubergine has sat, rinse away the salt, slice the onion and sauté them in olive oil, adding the capers, the pine nuts, the olives, and the tomatoes. After 15 minutes, remove the pot from the fire. Heat a second pot of oil and fry the diced aubergine, return the tomato pot to the fire and stir in the fried aubergine, together with the celery. Cook over a low flame, stirring gently, then stir in the vinegar and the sugar until the vinegar evaporates. Let th caponata cool and serve it1 cold and garnish with fresh basil. The Capunata Palermitana chi Purpiceddi is with fish and you will had one pound baby octopus (or squid), cleaned, one cup flour and 2 artichokes. Flour the celery sticks, the artichokes, the olives and the capers, and fry them. Fry the octopuss, add all to the tomato mixture, and finish cooking as above. This entry was posted on Thursday, May 31st, 2012 at 11:40 am	and is filed under Italian Recipes and Food. You can follow any responses to this entry through the RSS 2.0 feed. You can leave a response, or trackback from your own site.